Positioned in the intriguing range of Kumaon Himalayas, Mount Bhanoti lies near the exquisite Sunderdhuga BC. 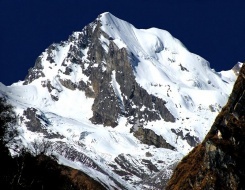 The climb to Mount Bhanoti offers a unique and exhilarating experience to the adventure enthusiasts. The serene trail to this imposing peak traverses through the picturesque route of offering the views of snow-capped mountains. The hike to the peak requires knowledge of ascending and descending in the snow. Thus, a person with a little amount of expertise can embark on the climbing tour to Mount Bhanoti. This 19 nights and 20 days itinerary take the climbers to a rejuvenating and thrilling climbing tour to Mount. In addition to the climb, the tour also incorporates trekking to Khati Village, Jatoli Village and Dhakuri Pass. Thus, the trek is a comprehensive package of nature exploration and adventure. Equipment you bring: Climbing Shoes, Rucksack, Crampons etc. In the evening take AC train from Delhi – Kathgodam at 22:40 hrs. Overnight journey…. Arrival at Kathgodam by morning, here meet our guide and drive to Bageshwar which will take 7-8 hrs. Upon arrival at Bageshwar check in to hotel. Evening free to explore the nearby area. Overnight stay at the hotel. Mornings after breakfast drive to Loharkhet and from here we will start our trek up to Dhakuri. It is an 8 km trek today that takes you down into the depths of the valley and then a fair climb to Dhakuri. Dinner and overnight stay in tents/rest house. Day 4 Dhakuri - Dhakuri Pass (Gradual ascending to Dhakuri Pass) 5-7 hrs. After breakfast in the morning, we will trek ascending to Dhakuri Pass, which will take about 5 to 7 hours. Enjoy an overnight stay in tents near Dhakuri Pass. Today in the morning, we will trek to Khati village from Khati village. We will walk descending to valley floor. An overnight stay in Khati village. In the morning, we will proceed for trekking from Khati village to Jatoli village. Enjoy an overnight stay in Jatoli village. In the morning, we will leave to trek to encampment named Kathalia wherein we will enjoy an overnight stay. The day is free to rest and Acclimatise. Today, we will proceed to Camp 1 where in we will do the opening of Camp 1 and take pleasure of an overnight stay. We will be occupying Camp 1 and enjoying a relaxing night stay. The day is free to rest. Today, we will proceed towards Camp 2 where in we will do the opening of Camp 2 and later enjoy an overnight stay. The day is fixed for occupying Camp 1 and enjoying a relaxing night stay. The nest two days of the tour is fixed for attempting to reach the Summit, our ultimate goal. Enjoy an overnight stay in tents for next two days. During the nest four days of our tour, we will be retreating from mountains while witnessing the real beauty of the nature. We will return back to Delhi by trail from Kathgodam. End of tour and services.